The Midnight Black Maine Rolled Wool Crusher Hat is a very versatile hat that looks great with any clothing combination. Whether it is with your farm overalls, casual clothes, or sports coat and jeans, as we say in Maine -- you’ll look “some shahhp!” Just roll it up and keep it in your pocket, glove box, purse or backpack. 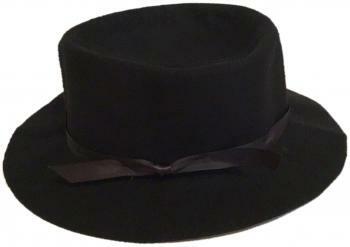 This black wool felt hat will be right handy when you need it. Choose your size at checkout.